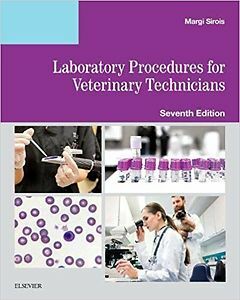 Ensure you´re at you clinical best with this comprehensive text covering the broad spectrum of laboratory procedures that veterinary technicians need to perform effectively in the practice setting. Laboratory Procedures for Veterinary Technicians, 7th Edition includes step-by-step coberage of the most widely used laboratory workups for microbiology, hematology, immunology, urinanalysis, parasitology, and cytology. Completely updatet content throughout reflects the latest advances in veterinary clinical laboratory procedures for improved patient service and outcomes. Updated and expanded Quality Control and Record Keeping chapter ensures you have the moste current information in this vital area. Updated Immunology section includes the latest information in this fast-growing veterinary technology area.